Just after I saw Jeremy's photo at Another Paris Daily Photo I knew what to post today. 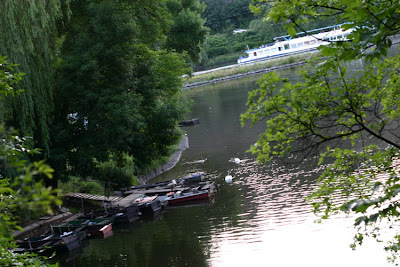 The boats on Vltava river I captured yesterday. This is at the southern part of Prague called Branik. Not too far from Prague's center (a few stops by tram, actually). It was totaly devastated after floods few years ago and is one of the most beautiful places in Prague now. Well, it was popular place to spend a summerday in the first half of the last century - as is obvious from really old Czech movies. This bay is used for fishermen's boats and there are tennis, volleyball and other playgrounds on the opposite side of the bay. Along with a kindof turists club's house - all in the style of that old movies, far away from a nowadays playgrounds and sports clubs. It has its own unique genius loci. There's a lane for roller-skaters and for bicycles, too. Also one of the best in Prague and definitely one of the most romantic in Prague :) I'll post another picture of it later.